1. Excel-based Time Series: For general signal analysis, data is imported in Excel and asc2 formats, allowing a large variety of spreadsheet and database-structured statistical programs to use the data. 2. Kubios Event-based Series: This applies only to the IBI data. A special conversion is needed to convert IBI data for use in the widely-used free Kubios HRV Analysis program. 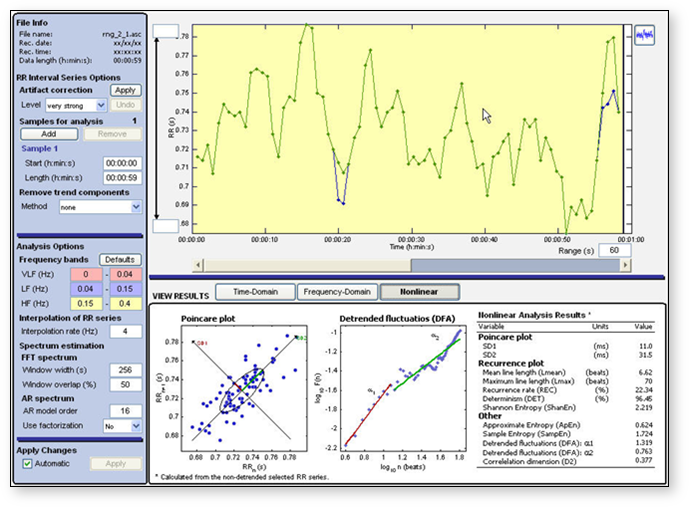 PhysioData provided both kinds of formats, for maximum flexibility.This Webpage highlights Kubios Analysis. "> 1. If you go to your J&J software start screen, you should see a button that says "Manage Data." > 2. Select the appropriate client and then select "Export." > 3. Another window will pop up. On the top left, click on “HR/IBI” and make sure to double check where your file will be saved by clicking on the drop down menu. J&J usually saves files in some hidden folder like your computer's program files, so you may want to create a new folder on the desktop or somewhere that is easier for you to find to save your data in. > 4. Double check all the signals that will be exported in the bottom right hand side of the window. > 5. Click ok. Your data should be exported in IBI format to the file you have chosen to save it in. Now you should be able to physically open it and look at the data. You have 2 options here. You can either open it in Excel, in which you could add an extra column for time, or you can open it in Notepad (which is what I usually do) by right-clicking and manually choosing the program to open your data with. When you go back to Kubios, just choose the same file in the "Open File" tab on the toolbar and Kubios should be able to open it as well. As long as your data is in IBI format, Kubios can open it regardless of whether you saved it in Excel or Notepad. > Try this to see if you can physically look at your data in IBI format...Files that Kubios can't open are usually because a 0 is contained in the IBI data. ...This list of numbers is where you should find 0s. To answer your question about the data having been recorded in the same manner - it doesn't matter here because ectopic beats or irregular heart rhythms are more likely to appear when a person is in the stressor phase for example.